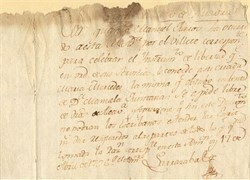 Historic Spanish Slave Emancipation Document issued in 1796. This item is over 213 years old. Uneven edge and some staining on top. Written in Spanish (South America) dated April 17, 1796 granting freedom to a slave named Maria Mercedes.